Mumbai, November 16, 2016: Switzerland Tourism today announced the launch of its Winter Campaign for 2016 and ‘Nature wants you back’ campaign for summer 2017. The Winter campaign will focus on all the action and adventure that can be explored in one of nature’s most artistic canvases – Switzerland, with the tagline ‘You can... but you don’t have to’. The summer campaign “Nature wants you back”, to be led by Brand Ambassador Ranveer Singh was also launched. The campaign tag line is the perfect expression of how one chooses to be ‘#INLOVEWITHSWITZERLAND; have an adventurous adrenaline filled vacation or a leisurely, relaxed trip whilst taking in the beauty of the breath-taking nature, scenery and serenity of the country. 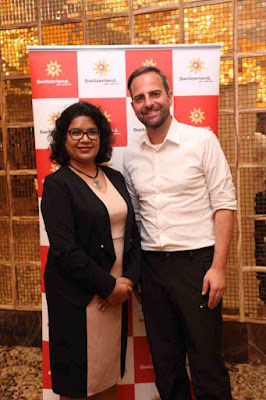 The campaign launched in presence of the tourism partners of Switzerland – Geneva, Lake Geneva, Glacier 3000 and Gstaad, hopes to further increase and sustain the double digit growth of 16% seen in 2015-2016. With an initial focus on the winter tourist, Switzerland Tourism will showcase the multiple options like skiing, sledging and snowboarding for the active traveller and Christmas markets, open air hot springs and igloo stays for the more relaxed visitor looking for pure white relaxation in winter. The summer focus for the campaign too, will be packed with an array of activities such as sky-diving, wakeboarding, canyoning etc. combined with Switzerland’s best touristic and nature highlights. The must-visit places in Switzerland are the attractions of Gstaad, which is known for its Bollywood movie spots where most Indians love to go and pose. 25mins away from the Gstaad centre is Glacier 3000 where you have snow throughout the year and has the highest situated toboggan run in the world. Lake Geneva is a very family friendly place with museums such as Chaplin’s World, Alimentarium and The Olympic Museum. The Winter Lounge at La Reserve Genève boasts of an open-air skating rink, lounge and festive evenings wherein one can relax. And of course, the Red Cross Museum and the United Nations are always a great attarction in Geneva. To have a fun-filled spellbound vacation, Switzerland is the place to go to.